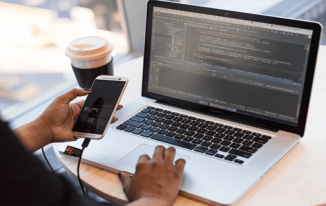 In the 21st century, instant messaging is one of the most effective methods of passing information between friends, family, business associates, and organisations. Regardless of where you live or what you do for a living, you obviously have caught the bug of messaging. We all send messages to our loved ones. We all receive and send uplifting and inspirational messages to people on a daily basis. We even keep our business contacts on our list to message them when something is needed urgently. The degree of messaging we do daily makes it imperative that we have an effective and efficient ways to receive and send messages without having to worry about delay messaging etc. 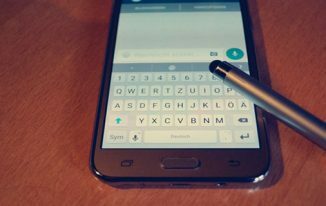 If you are someone who uses plenty of messaging apps like me, you will definitely crave a more encompassing, impressive and robust messaging app than the current popular ones. 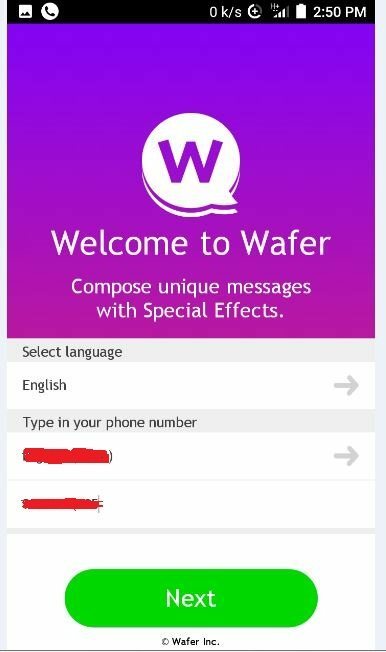 My search for such an efficient app has led me to Wafer Messenger. 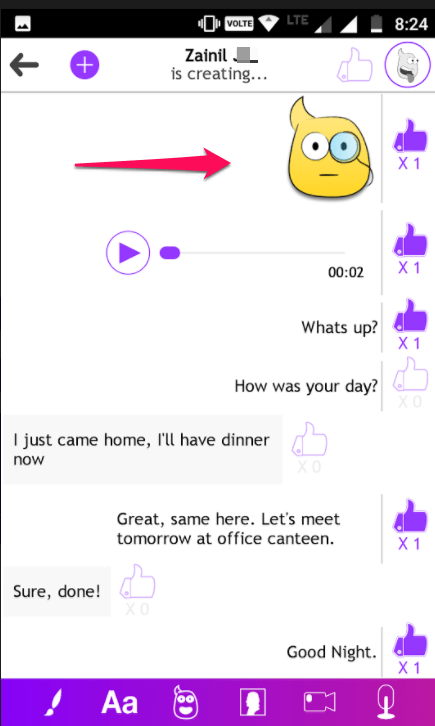 This amazing new app, released by a Luxembourgish startup easily outperforms all the other messaging apps I have used. 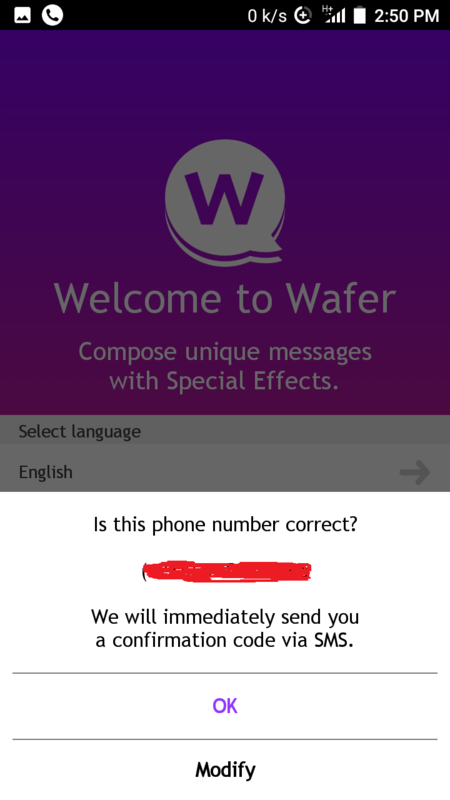 Before showing you how to use the messaging app and maximise its potential, I will tell you about the features that make Wafer Messenger so unique. Limitless Reach: with Wafer messenger you do not need your other messaging apps anymore! When testing the app I could create a message and send the link to this message to my friend on Facebook messenger. My friend could then open this link and talk to me through Wafer. 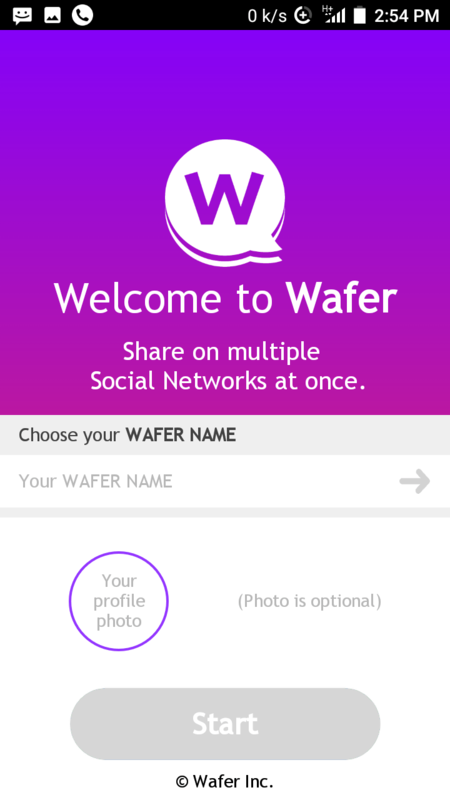 This is what makes Wafer so special – you can reach all your friends and contacts – even those who are not using the app. This means that I do not have to switch between different apps when talking to friends, family and colleagues: I just use Wafer! Send multimedia messages: When composing a message on this app, you are not limited to texts only. 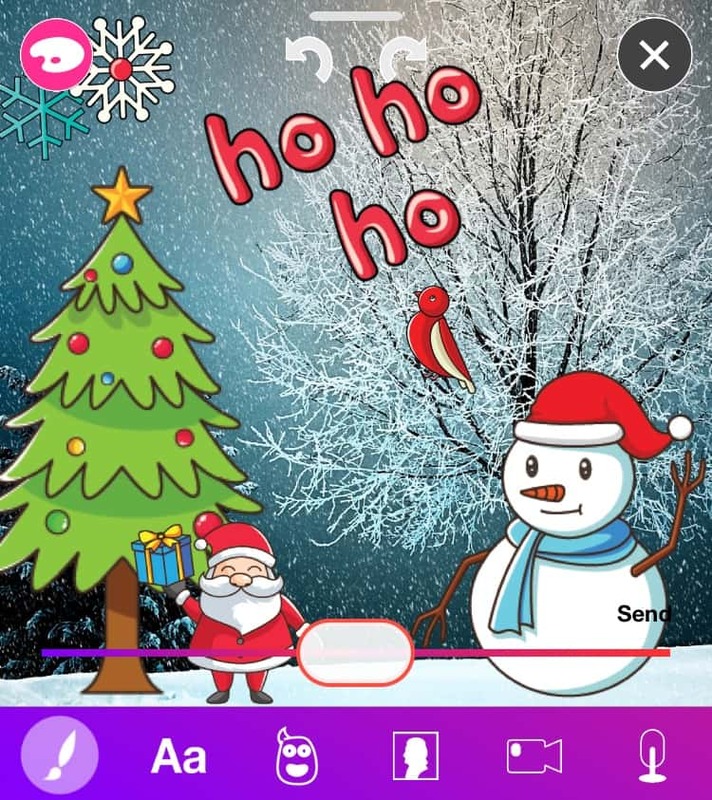 You can take advantage of its outstanding multimedia feature to send a mixture of texts, videos, and images to your recipient. You can combine up to six types of media in one message! Ultimate Connectivity: You can write and share powerful content to all your social media accounts with one single swipe! There is a bar between “Share” and “Send,” swipe to the left to share the message. Click on either of the social media icons and proceed from there. If you select Facebook, the app will ask for your permission to use your information to log in. Click “Continue” if you want to use it. Otherwise, exit the app. Also, if you choose Twitter, the app will also ask for your permission to proceed. Enter your Twitter username and password to proceed. Click the “Authorize app” to grant the app the permission to use your information for posting on Twitter. When you are through with either of the processes, your message will be immediately posted on your page. 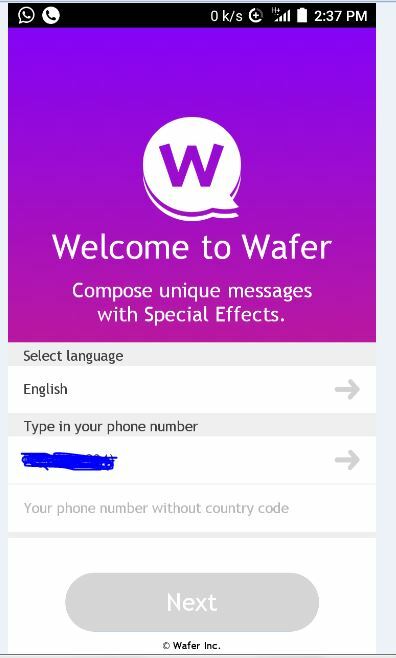 How to use Wafer Messenger app? 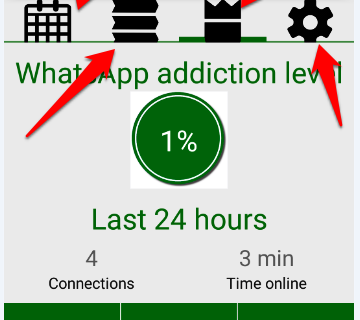 You can download the app from Google Play Store. If you are an iOS user, download it from here. 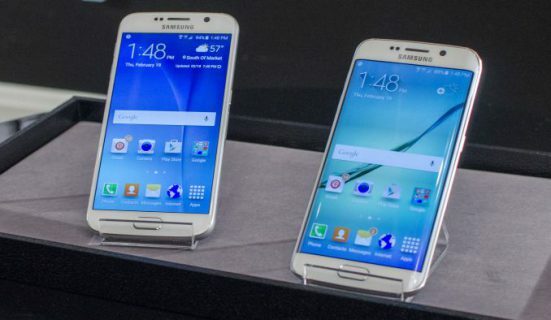 Launch it after a successful downloading. If you do, This is the inviting user interface of this awesome new messenger app. Supply the relevant information and click “Next” to continue. If you do, you will be asked whether the information you supplied is correct or not. Click “Ok” if the information is correct or “Modify” to edit it. 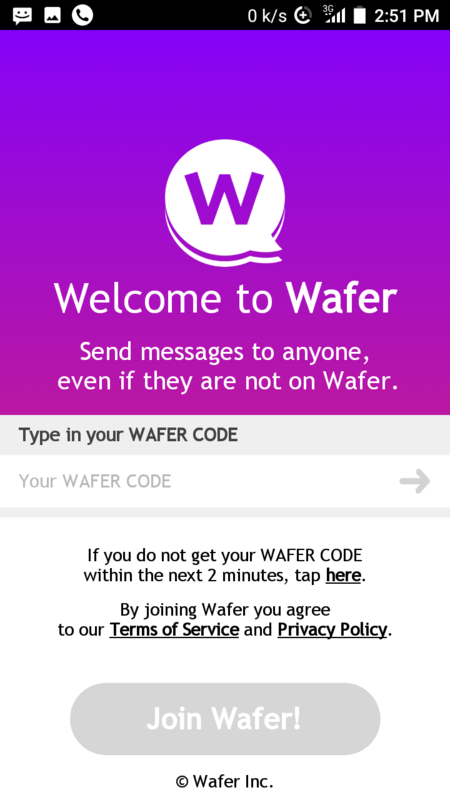 When you are through, click “Ok” a Wafer Code will be sent to your mobile. 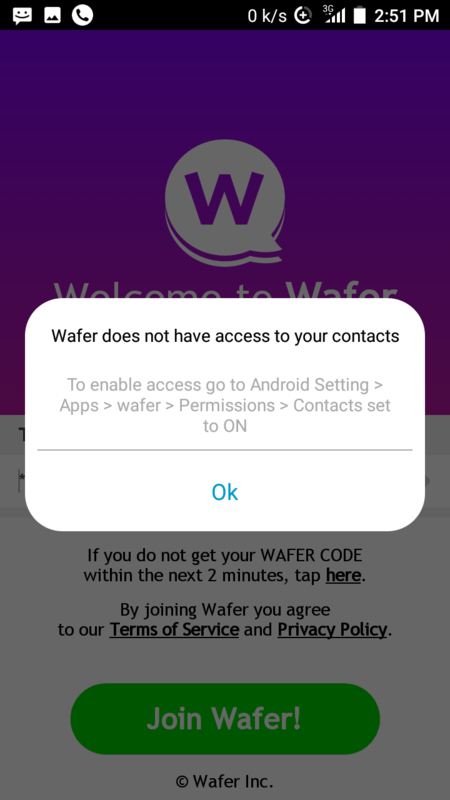 You will get a message that “Wafer does not have access to your contacts.” This will be followed by a set of instructions on how to make your contacts accessible to the app. Follow the set of instructions to enable access to your contacts. Then, choose a Wafer Name. Click “Start” to officially launch the app. Add a profile photo. This is of course optional. Click on “Start” when you are through. 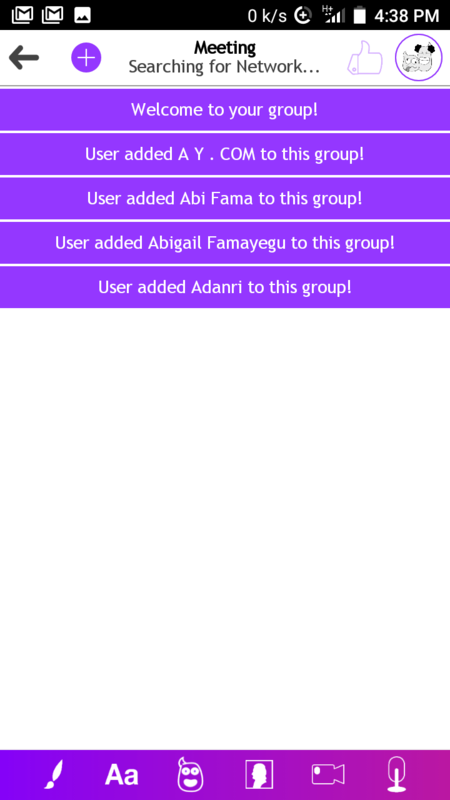 This will take you to the app’s menu where you can choose from “Group,” “Chat,” and “New”. How to Chat with your Wafer Contacts? 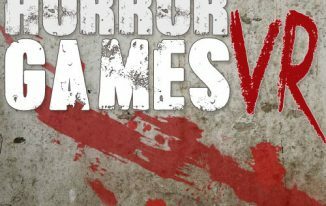 How to chat with a group? 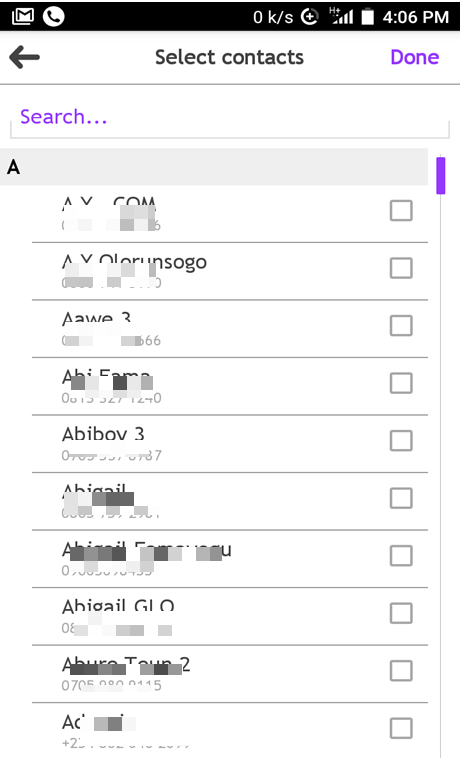 Select the people you want to forward the message to. Scroll down to see the complete list of people on your contact. Click “Done” when you are through. Enter the title of your message in the appropriate space on the new page. 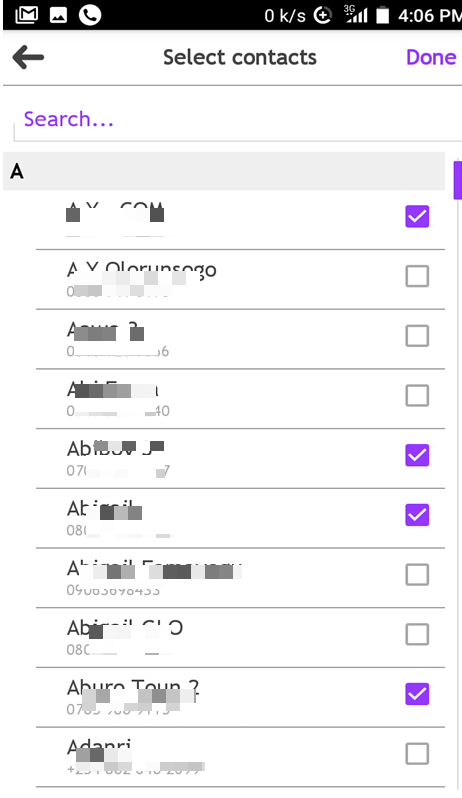 Click “Create.” This will create a group of people you can send a single message to. 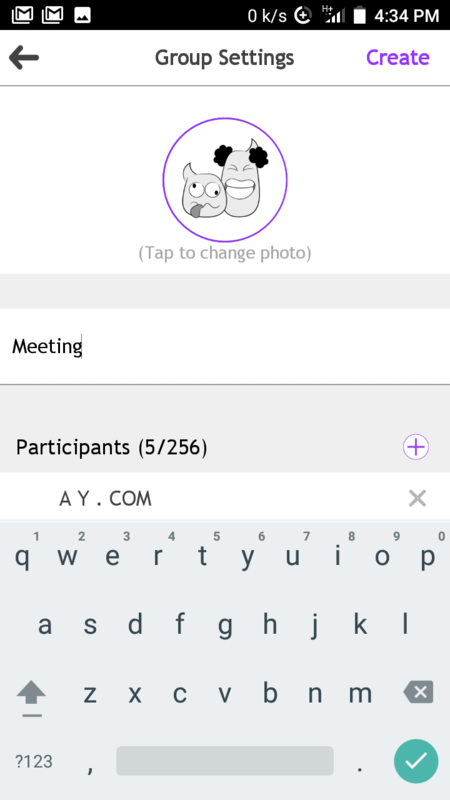 Click on the group’s message title to have access to the tools for composing the message and sending it to the group members. 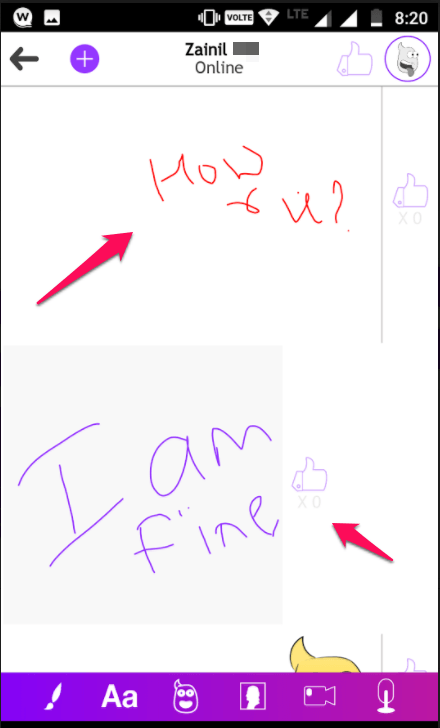 Press the “Aa” icon on the bottom of the page to compose your message. Click “Send” when you are through. Click the other icons to see their functions. Messaging is the latest trend, we always message our friends rather than calling them because it is easy, and the other person can read it later as well if he is not available instantly. Wafer Messenger is one of great messaging app that you can try today.